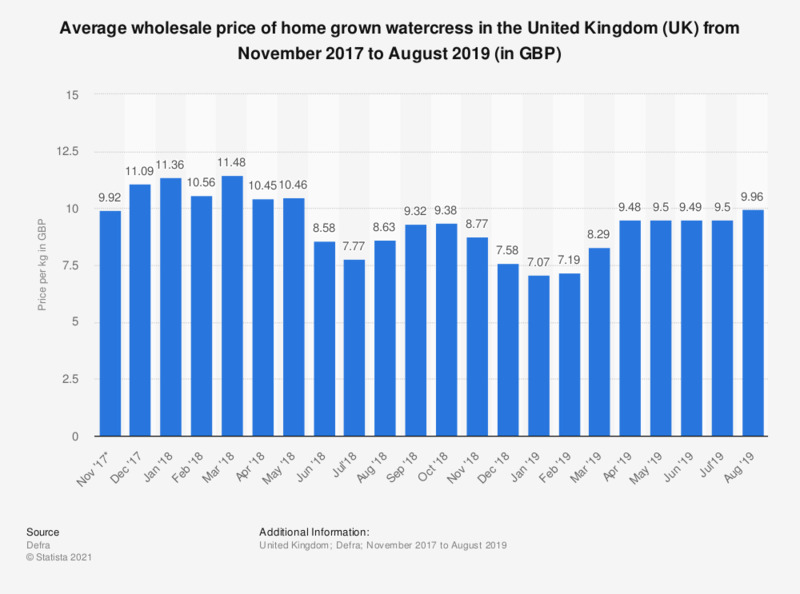 This statistic displays the wholesale price of watercress in the United Kingdom (UK) from 2015 to 2018. The wholesale price of watercress was valued at 0.52 British pounds per bunch in June 2016, a decrease in price of 8.1 percent compared to a year earlier. The source provides the following information: The following are the average of the most usual prices charged by wholesalers for homegrown fruit, vegetables and flowers at Birmingham, Liverpool, New Spitalfields and Bristol and for flower prices at New Covent Garden. As of August 2016, monthly datasets are no longer published. Monthly averages have been calculated from weekly data. Statistics on "Vegetable market in the Netherlands"